Elephants, and Tigers, and a Rhino! Oh, My! I thought I would do things slightly different this time. So, rather than just a purely sound related blog (pun intended? ), this will be more of a show and tell about my time in Sauraha, with some cool photos for your viewing pleasure. Don’t worry, there is still one recording I made further down. Let’s begin! Situated on the border of the Chitwan National Park, the jungle village of Sauraha is home to the Tharu people but has grown into one of Nepal’s top tourist destinations. After a painfully long drive from Kathmandu, due to traffic delays and our bus breaking down with a broken clutch, we finally arrived there last night. A quick dinner of soup, chips and chow mein, and it was straight to bed. Winner of the Elephant beauty pageant. Waking this morning, December 28th 2010, I find that we’re off to the annual Chitwan Elephant Festival for the day. I scoff down breakfast and set off walking through the streets of Sauraha. They’re brimming with locals and tourists all heading to the festival, most walking like us, but some riding horses, bikes and even elephants. This town reminds me a little of Byron Bay with its tourist oriented shops and restaurants and relaxed air. Turning left at a large rhino statue (not the rhino I alluded to in the title, that one comes later…), the road gradually turns to dirt as it leads down to a large clearing where the festival is being held. I pass through a tall archway proudly displaying the festival banner and find myself surrounded by eager festival goers enjoying the warm sun, food stalls and general festivities. I wander around soaking it all in when I suddenly come face to face with a large, rather oddly coloured elephant (see picture above). 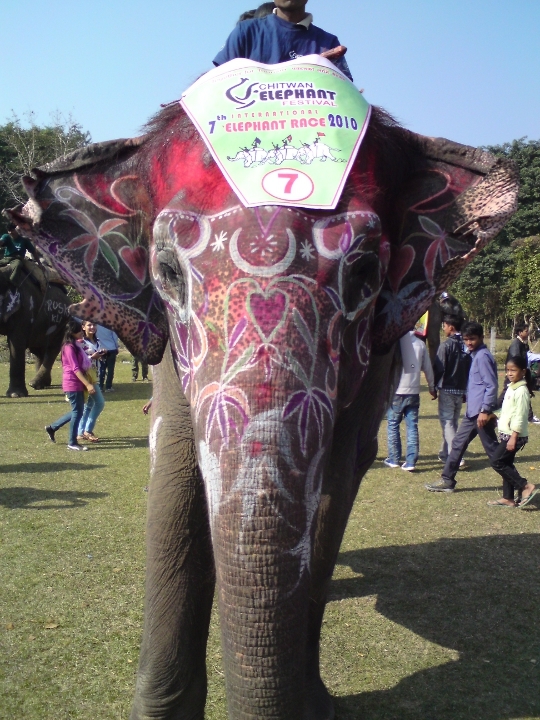 Dil, our Nepali tour guide, stops by me and explains that this dazzling specimen is part of the Elephant Beauty Pageant to be held later in the day. I look back at Dil, waiting for the punch line, but find only an earnest smile staring back at me. “Fair enough” I reply. Making my way over to the food stalls, I find a few of my fellow GE-OS travellers sipping on a cold beer. Wasting no time, I purchase myself a beverage, grab a plate of delicious noodles to go with it, and take a seat with my friends. We spend a while chugging down beers and chatting away in the warm afternoon sun as the crowds begin to gather around a large marked out area with a white, netted goal at each end. Feeling a tad boozy, I wander over to see what all the fuss is about. It’s elephant football (the real kind of football, you may know this as soccer)! Huddled in the middle of the pitch are eight elephants, each carrying a Nepali man dressed in yellow or green. I look on in awe as the whistle blows and the elephants begin passing the ball back and forth. Actually passing! This is better that most under 9s games I’ve seen. They pass, dribble, shoot and score! The crowd is going nuts! Next to me a pair of young locals are tugging at my shirt. I look down to see they’re trying to sell me a bag of peanuts, how appropriate. After a quick barter I’m snacking on some of the nuts and sharing them around with the other football fans. The game comes to an end with the green team victorious. As the sun begins to set, a few of us decide to hit one of the local shisha bars for some more drinks. Canoe ride along the Rapti River. The next day I wake up with a bit of a headache but two Panamax and a Hydrolite at breakfast sort that one out quick smart! 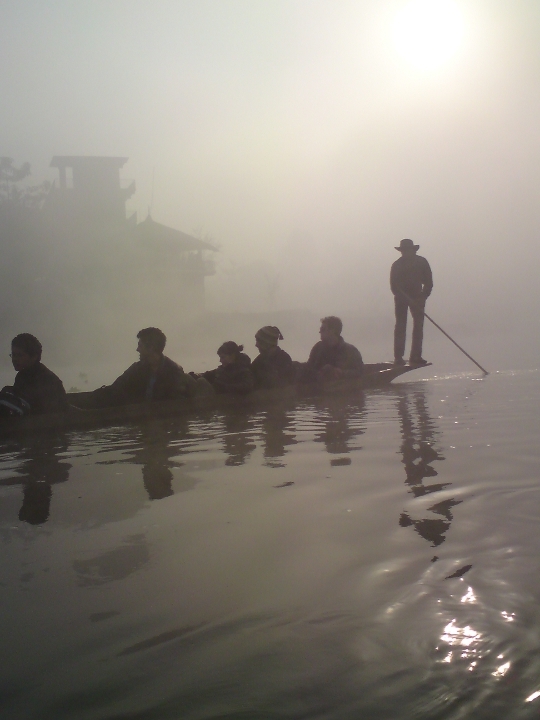 I’ve woken up early today to take a canoe ride down the Rapti River and once breakfast is finished I make my way down the foggy streets of Sauraha to where our vessel awaits. Here, we are split into two groups and each load into a canoe with a punter (the guy at the back who pushes the canoe along) and a guide (the guy at the front who explains everything) and we set off. The sun is just beginning to rise and the fog is thick and heavy across the water’s surface. To my left is the Chitwan Jungle and to my right are the banks of Sauraha. It’s so majestic as we float along the calm river waters, the air is still and silent. It’s almost spooky but I feel completely calm and relaxed, despite my hangover. As we make our way further down the river, our guide points out various native birds, nesting in the banks and surrounding foliage. As the sun casts its morning rays over the earth, the birds begin to sing their morning chorus and take to the skies. It would have been great to get a recording of the atmos here but I’ve left my rig back at the hotel to avoid losing it to the crocodiles below. Yes, there are crocodiles. 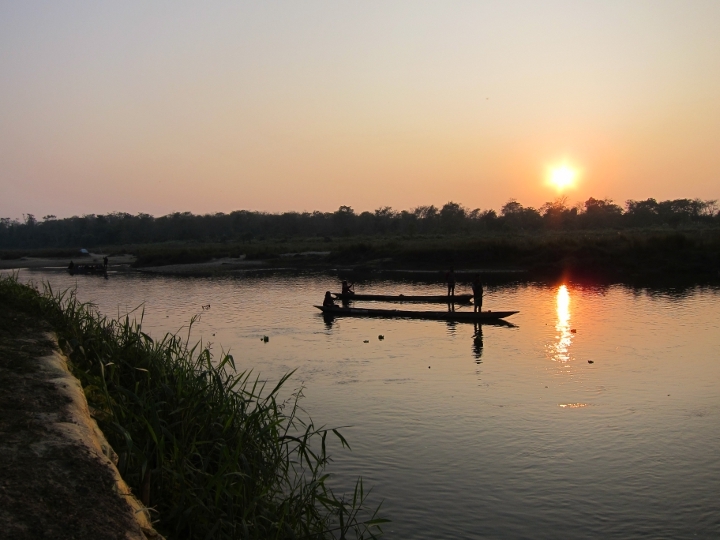 After an hour or so the two canoes come to rest on the banks of the Chitwan National Park. We all pile out and begin our trek back through the jungle. Walking in single file we wind our way along the thin dirt track, keenly observing the amazing flora and fauna which surrounds us. The jungle floor is covered in a thick layer of wet leaves and over head the trees climb high into the air, forming a canopy above us. Various birds can be heard calling back and forth and as I gaze into the tree tops I see a large peacock, nesting on a high branch. It looks very strange, such a large bird so high up in the trees, I never even knew peacocks could fly! 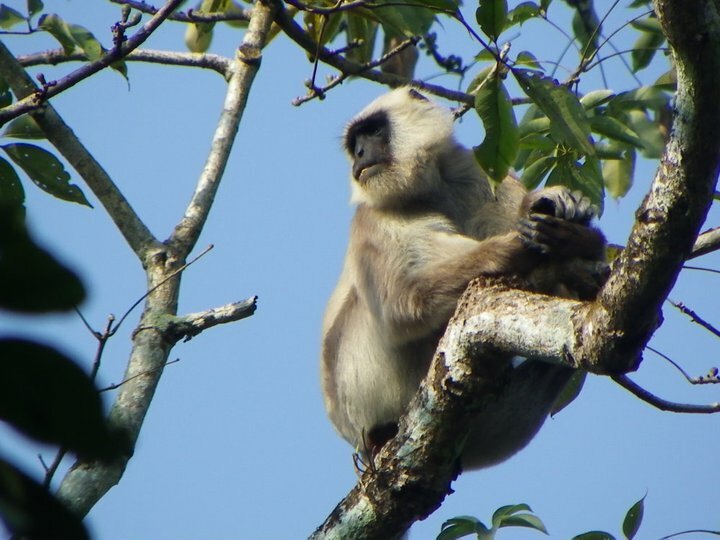 Gazing around a little more, I also see a few different species of monkeys amongst the branches, conducting their general monkey business. As we continue on our trek, one of the guides explains that we should walk in pairs to avoid getting bitten by a snake. “First person wakes up snake. Second person pisses of snake. Third person gets bitten by snake.” Makes sense. The group separates a little. Having paused for moment, I look down to find my boots covered in ants (see picture to the right). I jump out of the huge swarm that surrounds my feet and attempt to brush them off as I hop along awkwardly. Just when I think they’re finally all gone, I feel a sharp sting at the back of my neck. An epic crusader has climbed from foot to head and sunk his little pincers into my supple skin. I slap violently and the pain ceases. Victory: Jo. 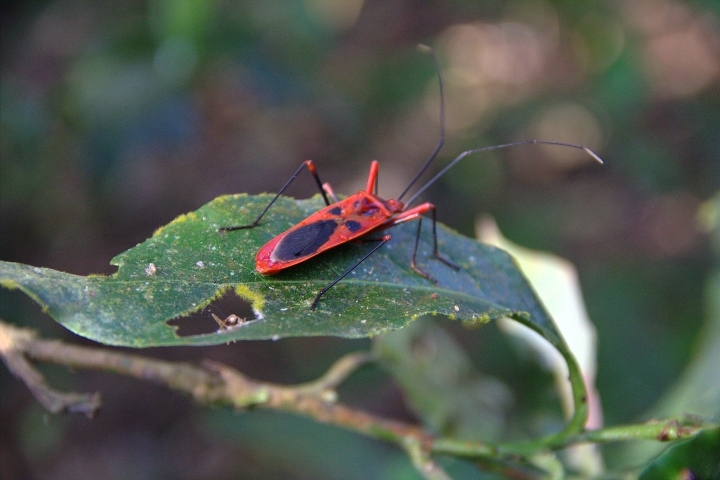 One of the many insects. 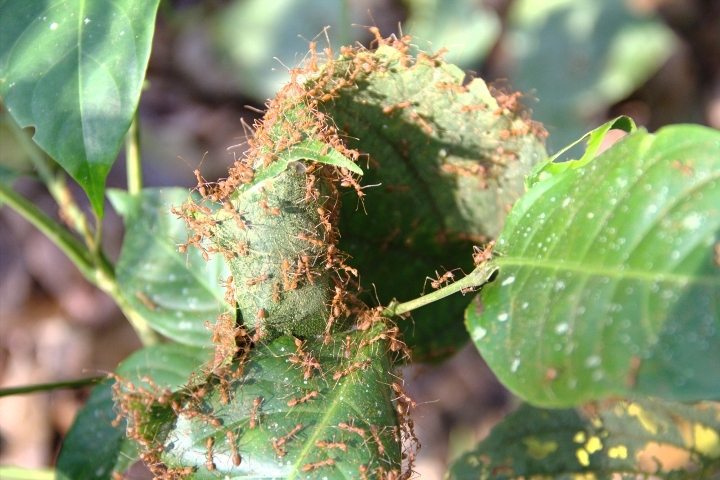 Walking on a bit further, checking first to make sure I’m not standing in another ants nest, I stop to look at some of the other insects crawling along the forest leaves. Every shape and colour you can imagine still wouldn’t cover the variety you see in some of these strange creatures, I find them completely fascinating. 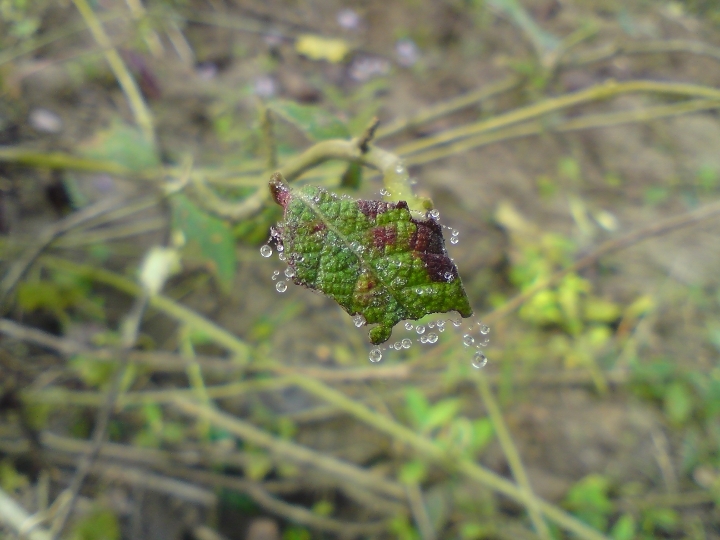 I also notice a particularly cool leaf, glistening with morning dew drops, and snap a quick pic (see picture to the left). Up ahead I find the group has stopped and gathered to look at something on the ground. As I catch up to them I peer down to see what all the fuss is about and find myself confronted by a huge footprint in the dirt (see picture to the right). 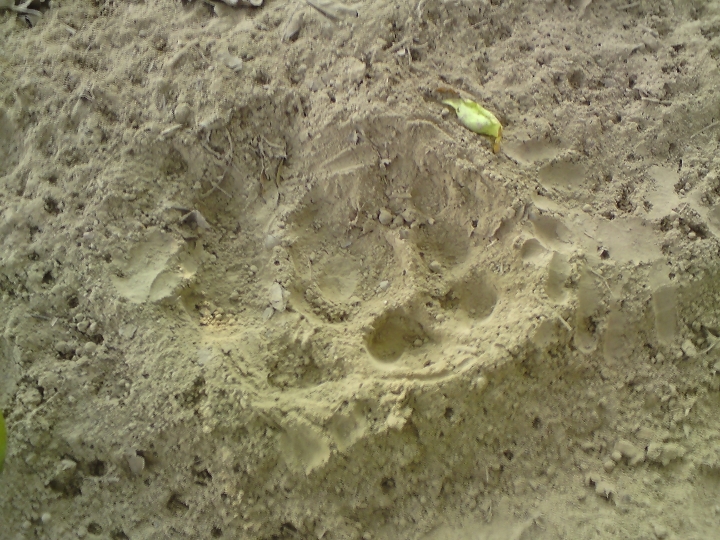 The footprint, which is larger than my hand with fingers outstretched, belongs to the Royal Bengal Tiger, a species which dwells in the Chitwan Jungle. I can’t decide if I’m hoping we see one of the spectacular beasts or that they keep clear and we avoid losing a GE-OS member (still unsure which I would rather). Finally we emerge from the jungle, reaching the end of our trek, to find the canoes waiting for us at the river bank opposite where the morning began. We jump back in and they carry us to the Sauraha side of the river where we discover it is time for elephant washing! I strip down to my boardies and jump in the cool river waters. It’s midday now and, with the warm sun now shining down on me, the water feels great. I swim over to one of the elephants where its Nepali keeper gives it a firm whack with a large metal hook, signalling the elephant to sit. At first I am a bit taken aback by this but later told that an elephant’s skin is an inch thick so it doesn’t cause them any pain, it is simply how they are handled. I climb onto the elephants back and am lifted into the air where it splashes me with water and throws me back off into the river. Incredible fun! The remainder of the afternoon is spent relaxing by the river at one of the local resorts, enjoying a few cold beers and some fried momos. Later in the evening we pile into a troop carrier and drive back to the jungle to spend the night. Staying in a three storey brick hut, we feast on fried chicken and rice, chatting well into the evening. Unfortunately, the recording I made wasn’t very good. M/S isn’t the best mic technique to use when recording atmos, and the self noise of my microphones are far too high to record such a quiet setting. It wasn’t horrible but not really worth showing, which is why I have left it out. …After forty minutes or so I wander back out and hit stop on my recorder. I pack up and head back to the hut to find two large elephants waiting to carry us back to town! Eagerly climbing aboard, four people and a driver per elephant, we head off into the jungle. I can’t say it’s the most comfortable seat I’ve ever sat in, but it’s definitely one of the most fun and exciting! Plodding along, our elephant transport pulls branches from trees with its long trunk, to both clear the way and eat as a snack. It’s fascinating to watch. As we wind our way through the jungle, no path or road needed, we come across more peacocks and other birds singing in the trees and a number of wild deer feasting on the low lying foliage. 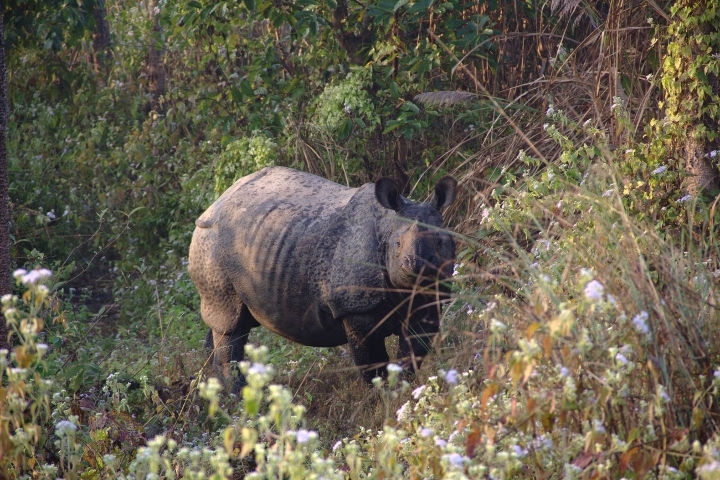 Spotted in the Chitwan National Park, a wild Rhino. Suddenly, from the other side of a group of trees, we hear a soft “pssht”. It’s the other elephant driver signalling something laying ahead of us. Our elephant slows as we peer though the trees. They rustle with movement. A firm heel kick to the elephant’s shoulders from our driver and we’re off and racing to find the source of the disturbance. Lumbering along, weaving in and out of the long grass, we spot it just ahead of us. A rhino. A wild rhino. Right there. Right in front of me. I stare in awe at the wild beast, it almost looks unreal. Thick, hard grey armour and a large single horn stare back at me as the rhino stops eating and looks towards us. Knowing I am out of harm’s way atop the large elephant, I watch the rhino go about its business before it decides we’re getting a bit close and stomps off into jungle. This is one of the most surreal moments of my life. With the rhino gone we continue our walk through the jungle, eventually reaching the end of our journey and dismounting our elephant friend. The troop carrier is there to collect us and we head back to the hotel before making our way to the Rapti River to record the Tharu Stick Dancers (link to my last blog post covering these recordings). Returning later in the afternoon, we head back down to the resorts by the river and enjoy a few beers while the sun sets (see picture to the right). Looking through the menu, someone notices a “special lassi” which costs twice the price of all the other lassis on there. Wondering what could be so “special” to incur such a price tag, one of my fellow travellers heads to the bar to enquire. Returning quickly they inform us, “It has weed in it!” Looking back at them I’m sceptical to say the least, but order one when our waiter returns. What’s the worst that can happen, right? Two and a half special lassis later, we sit there, watching the lily pads float down the river. Someone pipes up and says, “Imagine that the lily pad is actually still, and it’s us that are floating away.” All doubts of their legitimacy are put to rest. I’m gone. Floating on the clouds with my lassi drinking companions. As we giggle away like school girls our waiter returns and we ask him about the beverages. He tells us that each lassi contains “about five marijuana cigarettes.” I almost fall off my chair. As the evening rolls on I can barely stay conscious. Two of my companions have already retired to bed, while the rest of us gaze transfixed on the open fire before us. Fearing I may pass out at any moment I pull myself from the seat and stumble off to bed. 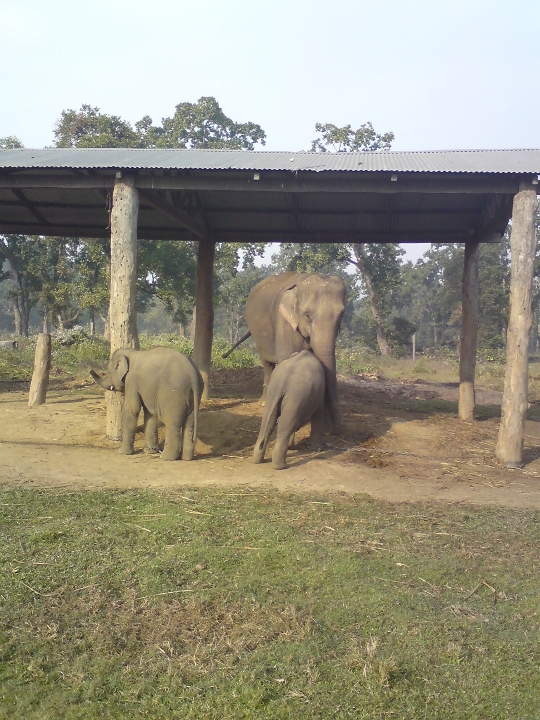 Two elephant calfs and their mother. Waking the next morning, I’m still high. I make my way down to breakfast (which I thoroughly enjoy!) and meet the others who are feeling much the same. 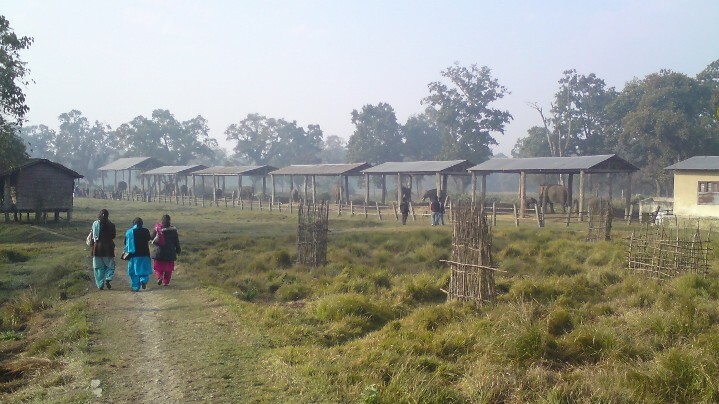 Once we’re finished, we pack up and head for a quick visit to the elephant breeding centre (see picture at top of page). Arriving at the centre I’m confronted with a row of elephants, all chained down with people watching them from a safe distance. A number of the elephants seem rather distressed and are swaying back and forth. I feel very unsettled by the whole place. After a bit of a wander around, I find Jarad and we decide to make a recording. I pull out my Sound Devices 702 but, instead of using my Schoeps M/S pair, we’ve borrowed the pair of DPA 4041 omni-directional mics from Greg. We set them up on the DPA stereo bar as a spaced pair, around 40cm apart (see picture below), to capture a nice wide soundscape. Recording the elephants with two DPA 4041. With this recording I was hoping to capture a feel of the scene, particularly the tension and stress in the air. Listening back now, I think you get some sense of that. The chains clanking together, the deep breaths of the elephants, and the painful calls all help to convey what I was feeling that day. You probably wouldn’t guess it, but the loud trumpet calls are coming from the baby elephant! They really are insanely loud! Unfortunately, the recording wasn’t perfect and I had the gain set too high to capture the calls, they clipped on the recorder. These have been repaired using iZotope RX to remove the clipping and lower the volume. The final result is still pretty good, I think. …I hit stop on the recorder and pack up the gear. I’m happy with what I’ve captured and very excited that we got a few elephant calls as well! The whole experience has been quite sobering, which is probably good considering the state of me when I woke up. – All photos courtesy of Jarad Avnell, Jonathan Olegasegarem and myself. – This post is long. Very long. Sorry!